The tall mound here is Dane John, the site of a Norman motte and bailey castle. Archeological evidence suggests that the castle was built on the site of a roman burial mound and originally straddled the old roman wall. 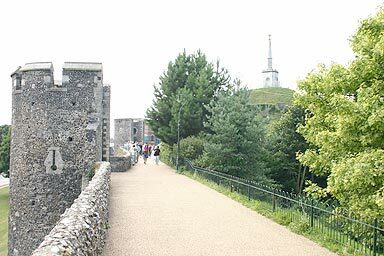 The obelisk and the walkway to the top were added by a Canterbury alderman called Simmons who was responsible for laying out the Dane John Gardens in the later years of the 18th Century.